Hey, Warner Bros, you're doing it wrong! The day Avengers: Endgame tickets go on sale is probably the worst day you could've chosen to debut the first poster for Todd Phillips' Joker movie. Oh well. It's here, and kinda cool. In advance of tomorrow's teaser trailer, the poster wants everyone to "Put On A Happy Face". Joaquin Phoenix's makeup-and-bloodstreaked take on the Joker is front and center, and who knows what awful thing he's staring up at. The glib tagline and the offbeat imagery gives the impression that Phillips is keeping some of the impish humor that comes with the character, while also telling a dark, R-rated origin stor disconnected from the DCEU. 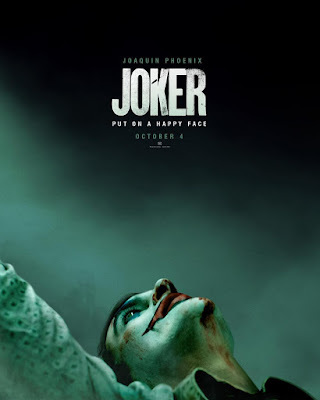 Also starring Robert De Niro, Zazie Beetz, Marc Maron, Frances Conroy, Bill Camp, and Brett Cullen, Joker opens October 4th.